Common Massage in Chiang Mai Thailand. 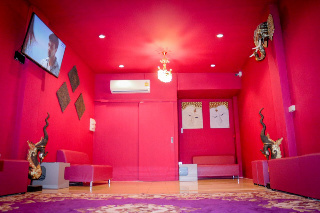 Common Massage is a well-established, popular gay Massage in Chiang Mai. It is the perfect place to relax in the peaceful and stress free environment of our beautiful massage shop decorated with a traditional Thai Lanna style. Common Massage is an exclusively gay massage house by men for men, for those who prefer spacious and private setting. Staffed by professionally trained and attentative masseurs. We have many handsome young male masseurs who can provide a variety of massage services for gay men. There are various massage package available from 1-2 hours of relaxing cream or oil massage, service by well-trained staff in private treatment rooms. Our male staffs take delight in maximizing your sensual pleasure and ensure that you will receive the best massage you've ever had. Common Massage is conveniently located in the Santitham district of Chiang Mai close to gay hotels, guesthouses and bars. An outcall service is also available.